Social work is a profession in crisis. (Hussein, 2014) Many social workers feel disillusioned in their work and there are serious problems retaining high-quality social workers. (Bowyer and Roe, 2015) This has multiple negative effects on social workers, those who employ them, those who receive their services, and on the wider society who funds their services. 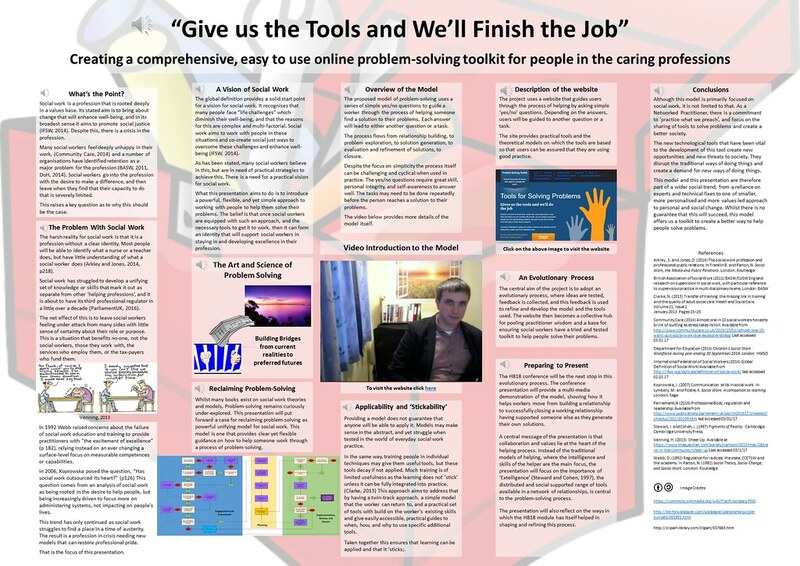 (Collins, 2016) This presentation proposes a response to this crisis, namely providing social workers and others in the ‘caring professions’ with a practical and easily accessible online toolkit to help those they work with solve their own problems. Using Self-Determination Theory (Roman, and Davids, 2016) as an organising principle, the presentation will show how a clear problem-solving algorithm, which allows social workers to select from a range of tools to address specific tasks can allow social workers to achieve a sense of competence, perhaps even excellence, and do this in a way that allows the social worker to maintain a sense of autonomy. The model that will be presented also focuses on the importance of the relationship between the social worker and the person or people they are helping. These three key themes of competence, autonomy, and relatedness are strongly connected to job satisfaction and to wider aims of well-being (Hohman, 2012, pp 24-25). The presentation itself will be a multi-media ‘walk-through’ of a website for social workers and others in the ‘caring professions.’ The website uses the model to help workers monitor their progress and choose the right tools for the job of empowering others to solve their problems. The presentation will focus initially on how the model can be used as a supervision tool, for supporting a supervisor in guiding a social worker to empower a service user to solve their own problems. This reflects the vital role that good supervision and good management play in supporting effective social work practice. Although the conference presentation will focus on social work, the model itself is not limited to one professional area. The model is for general problem-solving and can be used across a range of settings, from health care to education, in any situation where one person has a role that requires them to help another person. By the end of the presentation participants will have a clear sense of the key features of the model and the wider project. They will also know how to access further information on the problem-solving algorithm and the associated tools. Therefore, this presentation will be especially useful for anyone who has a role that involves helping others solve their problems. The website starts with an page that explains about the model and gives an overview of the underlying principles. This leads to the first question. As stated earlier, each question has a simple yes/no answer. It starts by checking if there is a working relationship. It then moves on to whether on not the person thinks they have a problem. You cannot do problem solving with someone who does not think that they have problem. It then focuses on whether the problem is solvable. Many challenging life events cannot change, they can only be managed, this makes them not a problem. A problem is only a problem if there is a solution, otherwise it is just a fact of life. So if thre is no sense of a solution the answer here would be ‘no’ here. In that task, the model directs the person to a task, in this task to create a solvable problem definition. This then links to the next question. The next few questions are designed to increase clarity, firstly about the problem . . .
. . . and then the goals. Once there is a clear description of the problem and the goal it is then possible to look at the possible solutions. This begins with generating multiple possible solutions. Mentally rehearsing them to reduce the number of potential problems or pitfalls before they are implementing. This leads to a refined plan which can be implemented by the person after the meeting. No matter how carefully the plan has been created, the first major test is whether the person actively commits to carry it out. If they don’t, then the model encourages the worker to go back through the process and find out where things have broken down. But assuming that things have gone well, in most situations the person will agree to carry out their plans. Central to this process is the idea that it is not the worker’s actions that will solve the problem, it is not even what the worker and the person do when they meet, it is what the person does between meetings. So when the person comes back the first question is to check if the person carries out their plan. It is, however, important not to panic if the person hasn’t carried out their plan. Quite often the person will have done something else instead. Regardless of whether the person carries out their plan or does something else instead, the next question is the same. The worker needs to check if it has improved the situation or not. If it has helped the situation, then the next task is to explore and explain those improvements, specifically to help the person gain a sense of self-efficacy about their ability to solve their problems. One of the key aims of this model is to be short-term, to reach a solution as soon as practical. This means that the worker needs to check if things have improved enough to finish the work. If they have, then the last task is to reinforce what has been learned and to close the relationship. Quite often the initial plan may improve the situation, but things may not have improved enough. It is then important to check if the person still has confidence in their preferred options. Sometimes, solutions take time, it is important not to rush and give strategies time to work. So if things have not improved enough, then the task is to refine the preferred options. This then leads to a further iteration of the process until things have improved enough for the work to end. As a nurse, it will be interesting to hear your presentation. I teach on level 6 (Third year) nursing modules that consider 'problem solving'. I'm sure there will be some transferable ideas here. Have you had a chance to 'try it out' yet? As an ex social worker and someone who works in safeguarding supporting those managing case concerns, this looks really interesting and I'm looking forward to the presentation. I was interested in what stage the project was up to - is it still in development or has any user testing taken place? Like Sarah I would be interested in the feedback received. Are there any plans to evaluate the impact of the site? As you point out in your abstract there are considerable concerns about staff retention and quality in social work which this could address and this could lead to an article for publication in one of the social care journals. I found your poster difficult to access - is it on OpenStudio? I couldn't increase font size sufficiently to read it or access the audio. I have tried a few initial trials with students, and sent out a cards based version to a number of willing practice educators (people who supervise student social workers). So far I have only had one response, which was positive. You can try out the first version of the web design here. http://www.problemsolvingtoolkit.co.uk/ But bear in mind this is a work in progress. It is still in the development phase, although I guess you could call it beta-testing. After Easter I will be testing it more robustly with students, then I will be looking to field test it small scale and evaluate it, before working it into a formal research project to validate its effectiveness. My primary goal is to support worker's sense of intrinsic motivation in their work by using self-determination theory, focusing on competence, autonomy, and relatedness. The autonomy is slightly paradoxical, by limiting choice to a narrower range we can increase a sense of autonomy and competence by allowing wise selection from a narrower range of tools. I will have another look at the poster. I must admit, I did 'cheat' slightly by using a larger poster size to give me more room to develop ideas, and that is at the cost of readability. I will try again and see if I can fix that. Thank you both for your input, and I hope I can deliver something of value for everyone. Hi Mark, I found myself having quite an emotional response to your abstract. I have never worked with social workers but several of my family and friends have closely, in their capacity as teachers. The narrative I always heard was that social workers were incredibly dedicated and had a very difficult job to do within a system that does not always value them. I really hope your idea is a success! My own impression from the outside was that the crisis in social work was caused by things like goverment/council policy, government/council ideology and society's values. I am not sure whether you feel that is a fair assessment? If so, I will be interested to see how your model operates in this context and how it interacts with other strategies towards resolution of the crisis. Hi Mark The issue of professional confidence and what fosters it is of great interest to me and my work in education. I am interested that your approach is about selection of tools and a framework and I will be interested in how this is received by social workers. Is it always about improvement? With teachers I find that they also need to support to recognise the effective parts of their current practice - I guess it may be the same for SW's? Are they hyper self-critical? is the vision of this site/tool that it is openly available or will it be for a closed audience/marketed externally? I can see a possible additional audience! What are the ethical issues around the research phase? how long do expect the beta phase to last?